I need to tell you, these bars basically have all the building blocks of what I consider delicious. Well, first, before any ingredients, let's start with something important. Arlene Erlbach, who created this recipe, hails from Morton Grove, Illinois. I consider Illinois firmly planted in bar country. No, not dives where you drink beer (although yes, that exists there too). I am talking about cookie bars. The midwest just does them right. Now, back to the actual ingredients. They have maple, which is a quintessential cozy flavor; they have peanut butter, which loves sweets and makes them nice and rich and dense. They have chocolate chip cookie dough, which makes everything better. 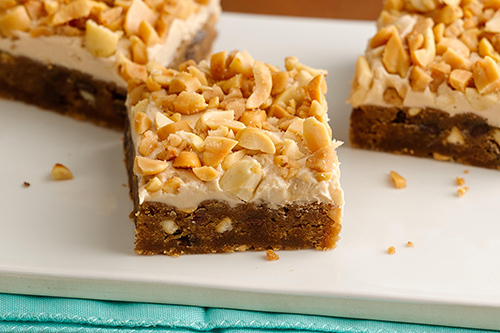 The peanuts, frosting, and toffee bits are hardly necessary after all that goodness. But no, I am certainly not going to turn them away. Heat oven to 350°F. Let cookie dough stand at room temperature 10 minutes to soften. Spray 9-inch square pan with non-stick cooking spray.